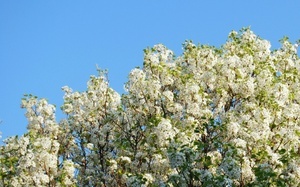 Photo of front pear tree finally in bloom! Last week/weekend was the annual Gerth Guys/Gals Great Golf Getaway from Wednesday night through Sunday night. This year it was Mark, Nan, Brian, Alan, and a guest: Flat Stanley. Flat Stanley is a children’s book wherein Stanley gets flattened by a falling bulletin board. FS wants to travel, so his family folds him up and mails him to California. 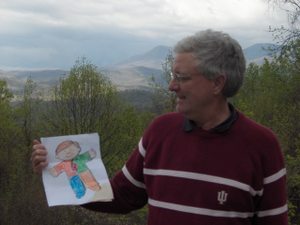 Our nephew, Steven, read this book in his class at school and sent Nan a Flat Stanley to take on the trip. Afterwards, she was to write a story about it for his class. 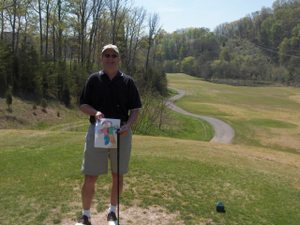 Thought you all would like a little something different today, so this is the story, with photos, that Nan wrote for Steven and his class about Flat Stanley's little golf vacation in Tennessee last week. Flat Stanley had a good time at the baseball game, but he wanted to see more of the country. So he tagged along on the Gerth family golf trip to the Smoky Mountains. 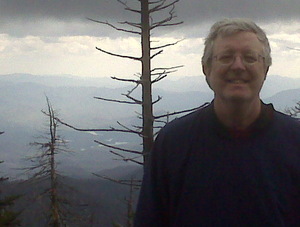 He went along with Mark, Nancy, Brian and Alan Gerth on their annual trip. After a nice drive from Cincinnati, they arrived at the Ruggles Ferry golf course. It was a beautiful sunny day and everyone enjoyed their afternoon of golf. Flat Stanley and the family went to the house they rented in Sevierville, cleaned up and went to dinner at Ye Olde Steakhouse in Knoxville. 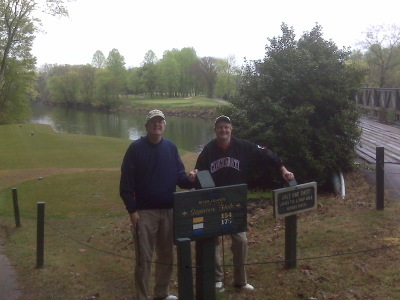 Then next morning the crew went to golf at the Eagle’s Landing Golf Club. 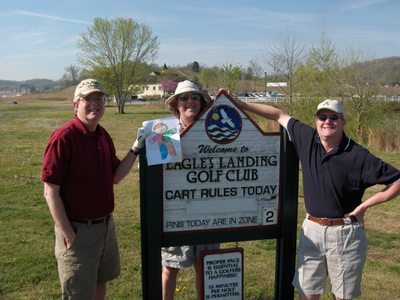 Here’s a picture of Flat Stanley with Mark, Alan and Brian. We had a fun day. Part of the course was under construction and it was funny to watch Mark climb down in a 30 foot construction hole and try to hit his golf ball out. After golf we took a trip to Pigeon Forge for dinner. We returned to the house after dinner and played some cards and took a dip in the hot tub. Saturday, we played golf at River Island golf club. It was overcast and rained on us for two holes, but otherwise it was a beautiful course and a nice day. 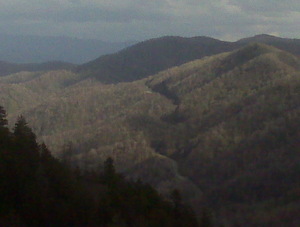 After golf that day, Nancy and Mark decided to go to the Great Smoky Mountains National Park. 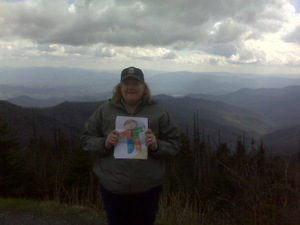 We had a nice drive to the park and decided to go up to Clingman’s Dome. The temperature went from 61o degrees at the visitor’s center to 44o at the top of the mountain. Here is Flat Stanley with Nancy and Mark in the park. On the way back to the house, we got stuck in a traffic jam in Pigeon Forge and it took an hour and a half to go 3 miles! On Sunday, we played at our final golf course – Egwani Farms. It was a lovely spring day and we were sad when we were done and had to come home. All in all it was a very nice long weekend of golf.